en: I don't take notes; I don't outline, I don't do anything like that. I just flail away at the goddamn thing. I'm a salami writer. 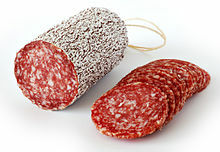 I try to write good salami, but salami is salami. You can't sell it as caviar.